The BIO HACKING team at Ambrosia is at it again, And this time with Ritual AM. Ambrosia’s Ritual AM It is promoted as a “morning biohacking theorem”. In simple terms, the idea is to replace your morning coffee (or add to it) with a super morning ritual! In his promo video Marc Lobliner promises a life changing supplement (again? ), with promises such as “this will set the world on fire” and other bombastic statements. In simple terms Ritual AM is suppose to get your body into a more efficient machine first thing in the morning by providing it with a hefty dose of MCT Oils, BHB salts , plus protein synthesis enhancers. Lets dig deeper into the label and see what we should expect. GET IT NOW ON TIGER FITNESS! Our own usual Ritual of breaking down the label is an easy one here with Ambrosia giving us all the details so we know what’s in each dose. Let’s start with the servings, we are looking at 30 serves per tub. At (24.7g) per scoop. Also nice factor to include is that the Ambrosia team are using non-GMO, grass-fed whey protein isolate (and you are getting 3g of it here). As well as some increasingly popular ingredients like goBHB ketones. So let’s break it down. Clean Cream: (4,200mg) Is one of many plant based natural creamer alternatives. To the standard Dairy creamer. This is here for texture and flavor. Based on our previous exprience with this formula it should taste great. MCT OIL POWDER: (5.7000mg) MCT which is common in most foods, simply stands for medium chain triglycerides, as opposed to long chain triglycerides (LCT), MCT is comprised of primarily caprylic and capric fatty acids. MCTs provide fast and lasting energy and are easily absorbed by the body. The premise here is to get your body an energy source that is readily available. (goBHB): Is naturally ketone body which is produced when free fatty acids are broken down in the liver. Ketones provide instant alertness and energy that fuels the human brain. It helps Decreases food cravings, improves insulin sensitivity and normalize blood sugar levels. It can also work as a powerful antioxidant and has a potent muscle-sparing effect. Velositol: ( 2,000mg) Velositol combines a very soluble amylopectin polysaccharide with a modified-release version of chromium. When you combine this with your whey protein, Velositol can help increase muscle protein synthesis (MPS) significantly more than if you just take whey protein alone. The premise here is to increase your protein synthesis throughout the day. Well, the concept is brilliant. 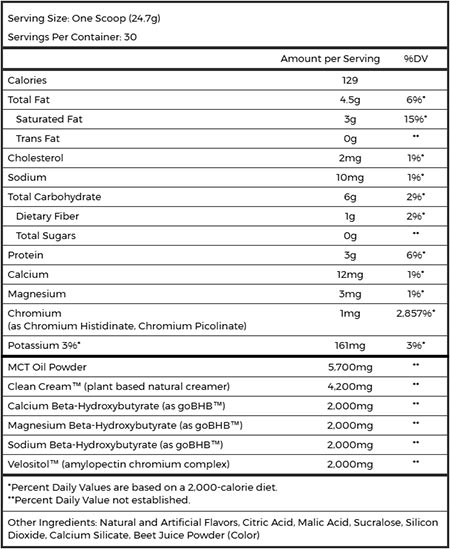 Though Ambrosia is not the first MCT heavy creamer (bpi’s KETO morning coffee creamer…) it introduces a very interesting mix of ingredients all from high quality sources and in nice dosages which are very well put together to get your morning going on the right foot – Natural Energy source (MCT + BHB) & Protein Synthesis. For a Ritual AM 30 serving tub, you’re looking at $54.99 which puts you out of $1.5 to start the morning with, But there are also bulk options available that can help get the price down to $50 a tub. This is not a cheap supplement. If you are looking to add this to your morning RITUAL, this would be a good time to sign up to the deal alerts newsletter on Fitness Deal News and we will let you know when a hot deal is around. Ambrosia and their Bio – Hacking range has once again brought out a uniquely designed supplement. A well balanced morning kick starter to add to your morning arsenal. We like the formula, the packaging (F’ng brilliant!!) and that you basically mix it into your coffee. Can this be a positive addition to your general health? Hell Ya! Will it change your life like Marc Lobliner promises in his intro videos? Is this the supplement that will “set the world on fire”. I personally don’t think so. But, if I find it for the right price it could become a part of my morning ritual.